I am a rising junior at Notre Dame. I am double majoring in International Economics and Program of Liberal Studies. In addition to these two subjects, I am also studying Mandarin Chinese. 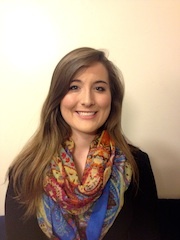 Outside of class, I work at the DeBartolo Performing Arts Center and am involved in the Notre Dame Symphony Orchestra. My SLA Grant is important to me because it will allow me to become more proficient in Mandarin Chinese, which will help me achieve academic, personal and professional goals. As an International Economics major, I had to choose a language to study alongside my economics courses, and my mind immediately leapt to Chinese. Not only is it an extremely useful language in the business world, which I hope to one day enter, but it is also a beautiful and dynamic language that is exciting to learn. The characters add a new level of dimension and meaning to words that just doesn’t exist in English. Learning Chinese will also help me pursue my future career goals. With my International Economics degree, I hope to be a part of a global organization that will allow me to use my foreign language skills frequently. Since Asia, and especially China, has a massive economic presence, Chinese is one of the most useful languages to know for business. My current career goal is to advise American organizations that are looking to expand their brand overseas, especially to China. Knowing Chinese will help me with this goal because it will allow me to converse with Chinese business leaders in their own language. By learning Chinese, I will have a great advantage in my future career aspirations. As a result of this summer study abroad experience in Beijing, I hope to not only become proficient in speaking and writing Mandarin Chinese, but I also hope to learn much more about Chinese culture and society. After experiencing Chinese culture first hand, I will be able to more fully appreciate and understand the Chinese language and way of life. I also hope to achieve a new level of comfort with international travel. This is the first major trip I am taking overseas, and the first one virtually on my own (without family). By the end of the summer, I hope I will be more comfortable adjusting to a foreign destination. At the end of the summer, I will be able to communicate in Chinese with native speakers on a variety of issues, especially business and economics related topics. At the end of the summer, I will be able to read most of a Chinese newspaper and various other materials outside of the textbooks I have used so far in my studies. 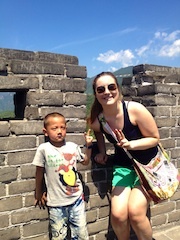 The Duke in China program offers many opportunities to practice language outside of the classroom. The program itself incorporates a Language Pledge, which requires that all participants only speak Mandarin Chinese for the duration of the program. This will ensure that I will constantly be practicing my language skills with fellow program participants and with native Chinese speakers. I will have many opportunities to explore the city on my own and gain language practice by experiencing the local community. 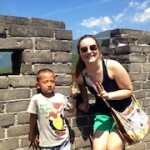 Duke in China also offers many field trips to various places of historical and cultural significance in China. These include weekend trips to places such as the Great Wall of China, Yinshan Talin (???? ), and Longqing Gorge (???). The program also offers a longer mid-term break trip to one of two regions, which as of now are either Xi’an or Shanghai. Through these trips, I will be able to put my Chinese skills into use by conversing with native Chinese speakers about the historical and cultural significance of the places we visit. I will also learn more about Chinese culture and history. The longer mid-term trip will allow me to practice speaking Mandarin Chinese with Chinese speakers who have different accents than those I will experience in Beijing. Hello from China! I’ve been here now for a little over a week. It’s been a little overwhelming, but mostly just extremely exciting! I’m with the Duke in China program this summer. We’re living at the University of International Business in Economics, which is located in a cool district of Beijing with lots of shops and restaurants. Eating in China has definitely been an adventure- the most dramatic difference is breakfast. The most common breakfast item here is ?? (baozi) doughy dumplings filled with vegetables or meat paste. They’re pretty good! It’s also been strange to have rice and/or noodles with every single meal, but I’m getting more used to it. My chopstick skills, however, are sadly still not up to par. My program is language-intensive, so every day of class is the equivalent of a week’s worth of material! Classes started Monday, and on Tuesday we signed a language pledge promising to only speak Chinese for the rest of the program. It’s been tough, and we have to break it sometimes since we can’t always express ourselves fully in Chinese, but it’s been worthwhile! We learn about 70 new words per day. I had my first exam on Friday too, I think it went well! I’ve visited a couple cool tourist spots as well. My friends and I figured out the subway system, which is 10 times nicer than any American public transportation I’ve seen. 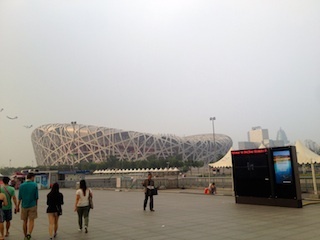 We used that to go to the Olympic Stadium, Birds Nest and Water Cube on Tuesday. It was really cool to see in person the places I watched on TV in 2008. 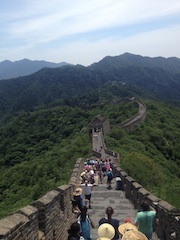 Then on Saturday, our teachers took us to the Great Wall! It was amazing, although it was a really rough climb. 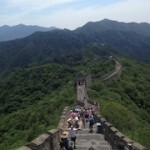 I thought people weren’t serious when they said the Great Wall is a workout- I was very wrong. It was definitely worth it to experience such a huge (literally and figuratively) part of Chinese history. That’s it for this week! I’ll report back next Sunday on my next adventures in China! Week Two down! This post is technically a little late but we are CRAZY busy here at Duke in China! We had the usual enormous amounts of homework every night- 40 to 70 words to memorize per day, plus essays! Needless to say I feel like ???????????????? (since last week I’ve improved my Chinese proficiency level). This week we’re tackling some hot topics like marriage between old men and young women, the Monica Lewinsky scandal, and the wonders of email. Exciting stuff! Despite the tough workload, I still managed to squeeze in some excitement! 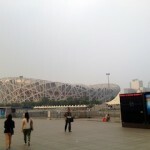 On Tuesday, a group of friends and I ventured out into Beijing to find the ??? (798) District, aka Beijing’s art hub. We took a loooong subway ride to get there, and upon arriving we realized we had to take a bus another 12 stops. Of course as soon as we stepped off the bus it started pouring! Sadly after we waited out the rain in a cafe, we realized all the galleries closed right before we got there. It was a fun experience with the Beijing transpo system though since I hadn’t ridden the bus yet. On Wednesday, a few friends and I took the subway to a fun coffee shop in the Sanlitun ????? neighborhood called Bookworm Cafe. It’s a cute little cafe filled with expats, so maybe not the best place to go to practice my ?? ?We did get to study with a great view of Beijing’s downtown area, so that was worth it. Saturday we took another field trip, this time to the Yinshan Pagoda Forest about an hour outside of Beijing. There were about 5 old Buddhist pagodas still standing, framed by beautiful scenery with the Silver Mountains in the background. Sadly what our teachers failed to tell us was that climbing the mountain ???? was mandatory! It was a steep climb, but worth it when we arrived at the top….despite the fact that the scenery below was obscured by “fog” (according to our teachers…though I suspect pollution). I can’t believe it’s already been two weeks! It feels like it’s been ages, though I definitely still need to work on ???????? ?adjusting to Chinese life). Until next week! This blog post is coming a little later than usual, but only because this week was CRAZY busy! Mostly due to school work, so sadly I don’t have too many fun adventures to report back on this time around. This week we learned over 100 new words per day, which seems impossible, but we somehow managed! Today was our midterm, thus I finally have time to write and relax a little! I definitely can tell my Chinese is improving though- I’ve struck up more conversations with strangers this week than previous weeks, and I think my conversational skills are slowly but surely getting better! Our vocabulary has (obviously) expanded dramatically as well. My favorite ?? (shout out Chen ?? ?and I also discussed Chinese nicknames this week, so I am now ??? (Xiao Lin Lin) a variation on my Chinese name ??? (Ma de lin). The best part about having young teachers and language partners is definitely learning more about the slang younger Chinese people use, rather than just the very formal language in our textbook! Last Saturday we visited Longqing Gorge, which was probably one of the most beautiful places I’ve ever seen and definitely my favorite activity so far. We took a short boat ride through part of the gorge to another area, where we visited some old Buddhist temples and got to paddle smaller boats around a section of the gorge. It was probably one of the most clear days we’ve had in China so far- the sky was a perfect shade of blue, very rare! It’s hard to fathom that we’re already halfway through our time here in Beijing. It makes me sad to think about- I love this city, and I’ve met some amazing new friends from Duke and Yale. We’re going to make the best of the rest of our time here! This weekend is our midterm break trip, and I chose to go to Shanghai! We’re taking the train tonight and traveling 10 hours overnight to get there. I can’t wait, and I’ll write all about it this Sunday! Wow, another week gone by here in Beijing….where has the time gone? It seems like just yesterday we arrived here, and now we only have 3 weeks left! Luckily, rhe last two weeks have been full of fun adventures! As I mentioned in my last entry, July 4-7 we took a long weekend “mid-term break” excursion! More than half of our program went to Xi’an, but the fun people (aka me) went to Shanghai! Well, I should say… we went to Suzhou and spent half a day in Shanghai. While the trip was not exactly as the program advertised it to be, I still had a fantastic time exploring both historic Suzhou and modern Shanghai. When we arrived in Suzhou, also known as the Venice of the East for its beautiful canals, on Saturday, we first took a boat ride down the central canal to get a view of the city. I can see where it got its Venice comparison from! We next visited one of the oldest and most famous gardens in China, ???/?? ?, or the “Humble Administrator’s Garden” . It was a little rainy, but we still enjoyed the beautiful architecture of the ancient Chinese garden. Finally, we travelled to another private garden and took in some traditional Suzhou art, music, and dance. It was a great view into traditional Southern Chinese culture! On Sunday we first visited a silkworm factory, since silk production is one of the main industries in Suzhou. It was fascinating to see the process from beginning to end! We then took an hour bus ride to Shanghai. In Shanghai, we first stopped to get a view of the skyline at the Bund, a famous waterfront feature. We then traveled to the Yuyuan Garden, Shanghai’s only public garden, and the bazaar next door. At the bazaar I completely failed at bargaining- maybe I’ll have more luck when I visit the Silk Market in Beijing! Finally, we went to the Shanghai World Financial Center, which at 101 stories tall has the world’s highest observation deck! The sky was a little cloudy, but we still got a fantastic view of the city. This week, in between the usual amount of work, my friends and I also managed to squeeze in a trip to the Temple of Heaven! The sky was actually blue, so we took advantage of this rare opportunity. It was a fairly quick and easy trip- we looked around the main temple and square, which was beautiful, and walked around some of the surrounding area for a while. This weekend we sadly didn’t have an excursion planned by Duke, so we decided to wake up Saturday morning to see the flag raising at Tiananmen Square! We got there just before sunrise (which is at about 4:30-4:45 AM Beijing time). It was surprisingly crowded- truly ???? (people as many as the mountains and sea). It was worth the exhaustion and discomfort to see the beautiful sunrise over Tiananmen and hear the Chinese national anthem play as the flag was raised. It’s easy to understand why so many Chinese citizens are moved by the event- I can only imagine seeing a similar site in America. This week it’s back to work, learning about ?? for tomorrow’s lesson! Fun stuff. I’ll report back next week with more adventures! Only 2 weeks left! I can’t believe my time in China is going by so quickly, it’s bittersweet! This week we again had the same giant workload, but we feel it’s getting slightly easier, which is hopefully a good indication that our Chinese level is improving! I definitely feel more and more comfortable interacting with native Chinese speakers, and my basic conversational skills have improved greatly. Hopefully in these last two weeks it just gets better and better! This weekend one of my friends and I decided to tour a couple of Beijing’s most famous spots that we hadn’t gotten to yet. We first stopped at the Lama Temple, or ??? (Palace of Peace and Harmony). This is the world’s largest lamasery (school for Buddhist monks) outside of Tibet, and also functions as a Buddhist temple. Going to a Catholic school, I haven’t had much experience with Eastern religious customs, so it was fascinating to see this very important aspect of Chinese culture. I felt almost sacreligious walking around while many people were praying and offering incense to the variant Buddha statues housed at the temple. The temple also featured a magnificent 80-foot tall Buddha statue, which is the most famous aspect of the temple. It inspired me to learn more about Buddhism and Eastern religion and philosophy in general, since our American schooling is so Western-centric. After the Lama Temple, we attempted to find a famous tea market… but utterly failed! My friend’s guidebook led us to an area near Tiananmen, which had a large shopping district and many hutongs but sadly no tea market. We did get to see the giant Gate to the city of Beijing, so we made the best of the situation! We next stopped by the infamous Silk Market so we could find some souvenirs for ourselves and our families. The Silk Market was NOTHING like I expected! When ??? think of the Silk Market, they imagine its previous incarnation of a bustling street filled with cart vendors. Today, the Silk Market looks more like a modern shopping mall. Each vendor has its own small store and sells all their goods from the store. While the vendors will still call out to you to attempt to get you to go in their shop, it really doesn’t have the atmosphere most tourists imagine. I got some great stuff through haggling though (but I won’t say what, since it’s a surprise for my family!) It was definitely worth checking out even though it wasn’t quite what I was expecting. Another crazy weekend down, and only one more to go! I can’t believe I’ll be leaving Beijing so soon, going back to America seems almost like a fantasy! Wow. It’s Sunday here in Beijing, and the close of my last full weekend here. This weekend was a marathon to try and cram in some last minute sightseeing, so I’m exhausted but feeling fulfilled! This Friday our ??? took us to see a ?? ?kung fu for you ????performance. It was more of a tourist destination than anything else, since the only native Chinese in the audience were our teachers, but it was still an interesting performance! The performers themselves are incredibly strong, and even if some of the stunts weren’t 100% real (for example…cracking a metal stick over their arms?) it still made for a good show. Saturday a few friends and I finally ventured to Beijing’s most formidable tourist attraction….The Forbidden City ?????Yes? it is the last weekend here and we’re just seeing Beijing’s most famous site…such bad Beijing tourists! We held off because we heard it was an all-day event, and the people who told us that were 100% right. There were people EVERYWHERE, the most ???? I’ve ever seen! And it was a sweltering 99 degrees, with no chance for shade. Despite this, the Forbidden City was just as incredible as I thought it would be. The sheer size of the complex alone is mind boggling, and the grandeur of the Chinese architecture was also astounding. It’s hard to imagine people living in such an incredible place, because it’s easy to forget the Qing dynasty lasted until the early 1900s! So it was pretty funny to see the “Imperial Telephone Center” sandwiched between the Palace for Mindful Contemplation and the Palace of Earthly Tranquility. We climbed up a mountain behind the city after making our way through the accessible parts and got a truly magnificent view of the entire complex. While it was terribly hot, at least the sky was a nice clear blue so we could see it all! Saturday night we had our end-of-semester performance, complete with poetry readings, skits, and of course singing. It was a great way to bring us all together near the end of the program, and I’m not ashamed to say I might’ve gotten a little emotional when my class sang ?? (a typical Chinese graduation song) together. These weeks have sped by so quickly, but they’ve been some of the most incredible of my life and I’ve made some fantastic friends. I’m going to savor every moment of these last 6 days here! Today, Sunday, my friend and I checked the last Beijing tourist site off our list: the Summer Palace. It was really hot again, and it didn’t help that the main feature of the Summer Palace is on top of a mountain! I really got my exercise in this weekend with all this ??and??-ing! The Summer Palace was also incredible, a monument to Chinese architecture and decor. We started in the most popular section of the palace, which is mostly restored. Part of the palace complex is a gigantic lake, so once we climbed to the top of the mountain we had a beautiful view of the lake and the rest of the palace complex. We took a boat across the lake to another section of the palace (you can see how massive this palace is!) and then walked back around the entire lake to where we started. We saw the emperor and empress’ living quarters, and the empress’s are particularly beautiful. Before leaving, we explored a section of the palace that hasn’t been restored, which I almost liked more than the restored sections. It was quieter there, and while the paint was faded it was easier to imagine how beautiful they were when their colors were at the height of vibrancy. Visiting the Forbidden City and the Summer Palace was a great way to cap off these last 2 months, and I’m glad I was able to experience these two amazing historical landmarks before I left Beijing. So I only have 6 days left. I’m already planning packing, airport transpo, and all that fun stuff…but in the midst of that, I can’t forget to enjoy every minute I have left here! I’ll check back in when I get to the US…see you on the other side!